Every student in the room said that they would do it all again next year. 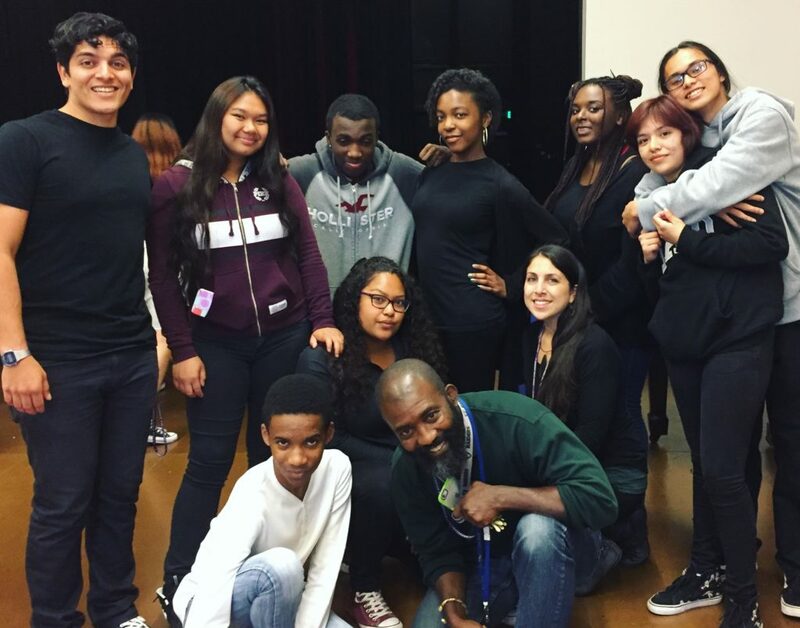 These students at Leadership Public School (LPS) in East Oakland were still enjoying the high from performing West African drumming on stage in front of their classmates in the auditorium on the Castlemont campus where their charter school is co-located. After the lunchtime performance, the students had gathered in the former closet that has been turned into the spacious office of the LPS Intervention Counselor, Stephanie Camoroda, LCSW. This room has been the site of their weekly drum circle throughout the school year. A staff person with a clipboard came in and announced that “a lot” of students had approached her after the performance to say that they wanted to join the drum circle next year. That news further elevated the already celebratory mood in the room. “There’s lots of love in our circle,” said Camoroda. “There’s a sense of togetherness,” agreed third-year student Shawntell. It was apparent that the students have grown close over the past year. Even though they were supposed to be in a classroom somewhere else, none of them wanted to leave, and had to be ordered out by Camoroda. Camoroda was not hired to bring an arts curriculum to LPS. She was hired to counsel students who were having attendance, behavioral, and academic challenges. She quickly learned that the students on her caseload have dealt with a variety of trauma from an early age and were in need of healing. “Providing academic support requires providing social emotional support,” Camoroda said. She wanted to create culturally- relevant healing spaces for her students and when she told the Technology Manager at LPS, Kokou Soglo Katamani, he suggested a weekly drum circle be held in her office. “When you form a circle, a sacred space is created,” said Katamani, who grew up in Ghana and Togo, and has also lived in Benin. A member of the Ewe ethnic group of West Africa, he is a vocal advocate for the healing powers of drumming, singing, and dancing. Katamani believes that the best way to address trauma is not through the head, but through the heart, and he draws on his own personal experience as tangible evidence. He came to the U.S. as an exchange student at Georgetown, but dropped out once the funding from his program ran out. He was also struggling to adapt to a completely different culture without any personal support, so his family sent him a set of traditional Ewe percussion instruments to help him weather the storm. While he addressed his financial situation by teaching French at a Montessori school, he addressed his personal situation by teaching drumming. Ewe drumming is a communal experience, so Katamani teaches drummers to be Azagunon, or people who play for others. He stresses connectedness and commitment to the rhythm. “It doesn’t matter how you drum, it’s how you interact with everyone else,” he said. In a world where more and more people are trying to go viral but less and less people are actually connecting with each other, this IT guy brings people together in intimate, low-tech settings. “A village is always needed. The spirit is thirsty,” he said. His method resonates with the students at LPS. Katamani, who had never used a computer before he arrived in the US in 1993, caught the technology bug while learning how to use a microfiche machine at Georgetown. When he visited a friend in the Bay Area in 1999, he fell in love with the East Bay, and when an Americorps technology training program offered him the opportunity to move out here, he did. He was placed with the Oakland Unified School District, where he learned the IT field. When he finished the program, he was hired to manage it. Working for OUSD for eight years, he eventually started teaching Ewe drumming at OUSD’s technology learning center. The majority of students in the drum circle are African American, even though that population constitutes a small percentage of the LPS student body as a whole. They were definitely an underserved population before Camoroda and Katamani teamed up. 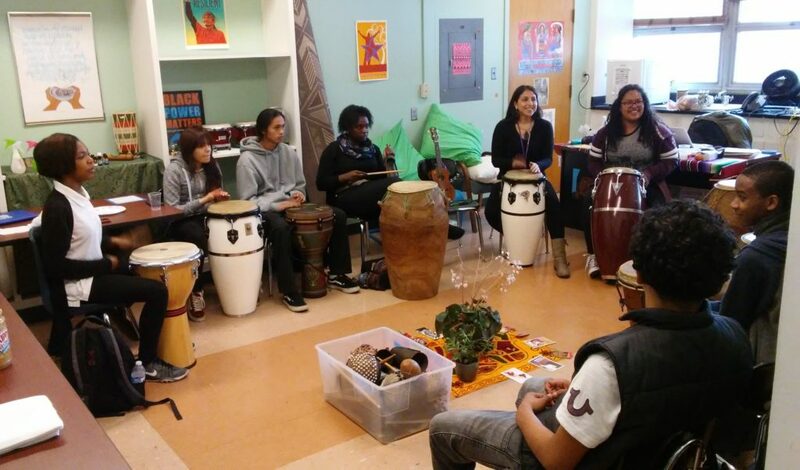 Throughout the past school year, Camoroda has hosted the drum circle every Wednesday at noon. She brings in lunch, which she pays for out of her own pocket, arranges the chairs in a circle, and creates an altar in the middle of the circle. The students who attend share food, check in with each other, drum together, and check out with each other at the end of the drum circle. 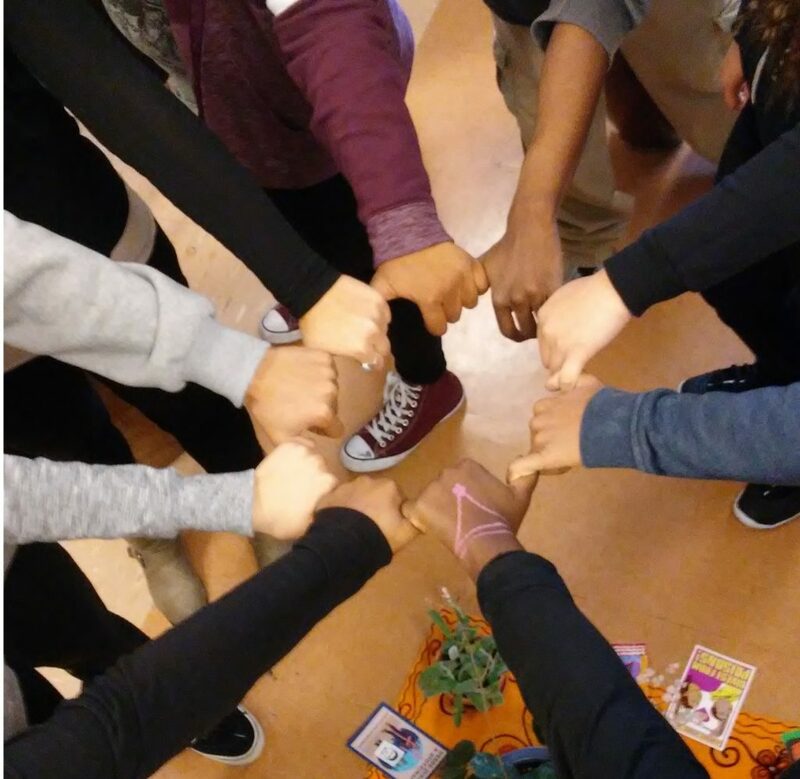 She calls the weekly ritual “undercover healing” because while it is a class where students are learning skills, they are also experiencing community, belonging, friendship, love, and connection: all things that help them cope with the many challenges in their everyday lives. The drum circle is not mandatory, but students took to it early in the year when it first started and have returned weekly ever since. Camoroda says that the drum circle is one of the few extracurricular activities offered at LPS because it is a small school. She said that it is important to develop and maintain creative spaces for students to express themselves and experience community. “The students are so amazing,” said Camoroda. Katamani noted that his employers are supportive (he does these circles all over the Bay Area), but while Camoroda credits him and the students for the success of this particular one, he credits her. This is an important function of a pace of learning ~ how to fit in, come together as a group (family) (team) clan or tribe. To make personal connections without stress. Congratulations to the leadership in this school!